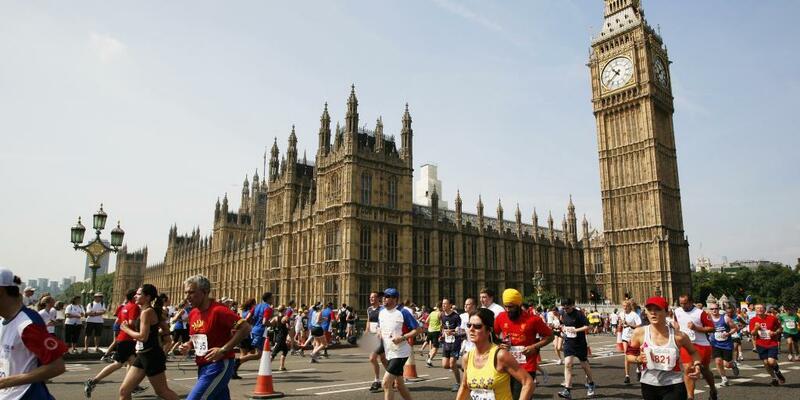 On Sunday 22 April, the world-famous London Marathon will take place, drawing almost 40,000 runners and thousands of spectators to England's capital city. This year is set to be the warmest on record, so we're expecting even bigger crowds than usual and a gloriously sunny day out for everyone involved. If you're one of the runners taking part in the race, you'll probably want to keep your focus on the road in front of you. But if you're planning on joining the crowd of spectators watching the 2018 London Marathon and cheering on the participants, here's a guide to the running route and what you can expect to see along the way. 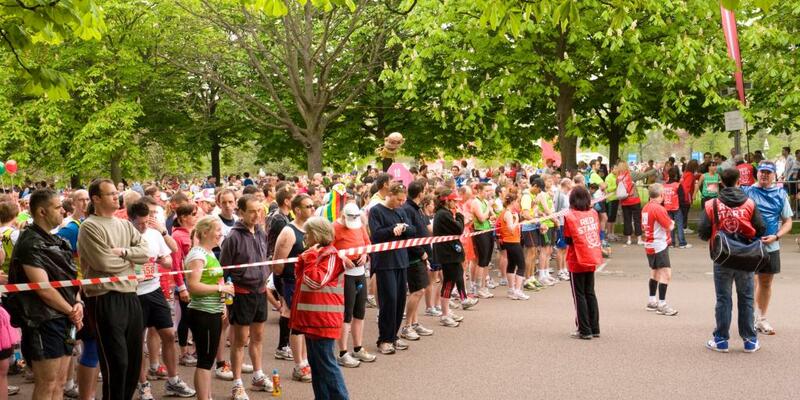 The big mass race begins at 10am in the south part of Greenwich Park in southeast London. The starting point is right near the National Maritime Museum and the Royal Observatory, a world-famous London landmark commissioned by King Charles II in 1675 and designed by Sir Christopher Wren (who also built St Paul's Cathedral and Kensington Palace). This is the location of the Prime Meridian, the point against which all time and distance is measured around the world. Could there be a more fitting beginning to this epic race? After setting off from there, the runners will head east toward Woolwich and around the Woolwich Dockyard. The race then passes Charlton and heads to Greenwich town centre and Cutty Sark, the legendary tea clipper ship on display near the River Thames. If you choose to watch the beginning of the race in Greenwich, the party doesn't have to end after all the runners have set off. If you want to go on an adventure, why not take the Greenwich Foot Tunnel from Cutty Sark to the Isle of Dogs? This funky pathway under the River Thames is a site worth seeing on its own, and it will bring you close to mile 17 along the route. For spectators who want to be near the beginning of the route, Woolwich is a prime spot for watching. You can get the DLR (Docklands Light Railway) to Woolwich Arsenal Station (expect LOTS of people!) and park up near the three-mile marker along the route. If you want to get a drink before watching the action, you can head to Dial Arch, a lovely pub located in an old munitions building near the river. You won't have direct views of the marathon from the pub, but it's an easy two-minute walk to the route. This year for the first time, the Cutty Sark is opening up its main deck to spectators watching the race. It's a unique and fun way to see it, but there's likely to be lots of people there (and entry costs £35). Alternatively, you could head to a pub nearby like the Gipsy Moth, which is right next to the Cutty Sark ship, or Old Brewery, which is also nearby. Again, it's going to be very crowded, so get there early! Greenwich Union and Mitre Greenwich are also nearby the action, without being front and centre, so you might have a better chance of finding a spot there. Next stop on the route after Greenwich is Tower Bridge, via Rotherhithe and Bermondsey. Runners will leave Greenwich and race along the Thames Path. Finally they'll reach Tower Bridge, one of the most iconic landmarks in all of London. Tower Bridge, built between 1886 and 1894, is a combined bascule and suspension bridge, with two large moveable roadways (“bascules”) that allow boats to pass by below. With its distinctive stately structure and pretty red, white and blue colours, it truly is a great marvel of architecture. Tower Bridge is one of the most popular places for spectators to gather as they cheer on the runners from the sidelines. Officially, Virgin discourages people from nabbing a spot here because it gets so packed. But if you're tall enough to see over the crowds and you don't mind feeling like a sardine, it really is a great and exciting place to set up camp for the marathon. 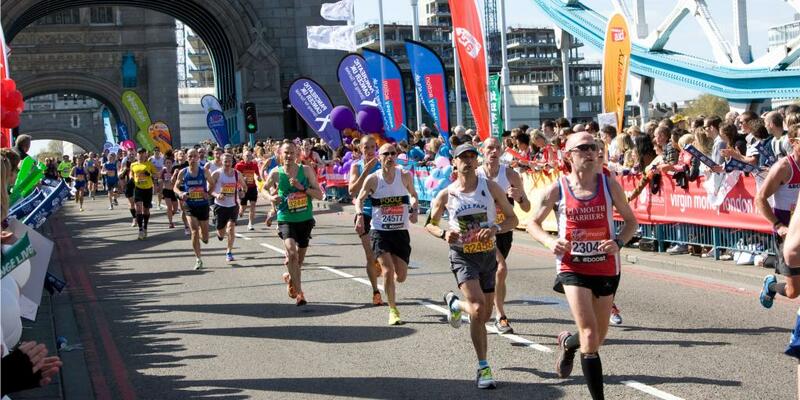 Once they reach the north end of Tower Bridge, the runners will speed past the famous Tower of London to their left before turning right and hitting the halfway mark. Miles 13 to 22 consist of a loop around the Isle of Dogs and Canary Wharf, the financial centre of London. This stretch of the run is all canals, docklands and skyscrapers, giving runners a grand tour of the modern daily life of London workers. Canary Wharf is where all the major banks and UK firms are based, but there's also a shopping centre and plenty of bars and restaurants around that attract visitors from all walks of life. Carrying on south from Canary Wharf, the London Marathon route winds its way to Mudchute, at the southern tip of the Isle of Dogs. This underrated section of London is quiet, picturesque and a great place from which to watch the race. Mudchute Park and Farm is a large urban nature reserve that's home to dozens of animals, from chickens and ducks to llamas and pigs. Mudchute Park is a fantastic place to visit if you're exploring London with kids. Plus, its unique setting - with the glittering buildings of Canary Wharf contrasting against the green grass of the farm - is unforgettable. If you're bringing children along with you to watch the race, you might want to choose this place as your base. The London Marathon route turns back north after passing the Mudchute Farm and loops around Poplar, All Saints and Westferry stations before passing St Katharine Docks. This area, which was opened in 1828, was once one of the main commercial areas of the city. It was badly damaged during World War II and closed down for years before being redeveloped in the 1990's. These days, the St Katharine Docks are home to flats, offices, and many restaurants and shops. There's also a World Food Market that takes place here every Friday. The route then passes Tower Bridge and the Tower of London once more before continuing westward, onto the homestretch. As we've mentioned, you can join the throngs on Tower Bridge itself for a thrilling, albeit super crowded, vantage point. If you'd rather something a little less up-front, there are a number of pubs and restaurants nearby. The Bridge House and Draft House pubs are both on the south end of Tower Bridge Road and should provide pretty good views of the race. You could also park up at a spot by the River Thames just east of the bridge. You might not have great views, but the atmosphere will definitely be buzzing and you'll be within easy earshot of all the cheering! Get in touch with nature and find a spot on Mudchute Park to watch the race. This is especially ideal if you're bringing along kids, as you can take a picnic and make a day of it. Plus, you can spend some time with all the animals in the farm once the runners have passed by. There are also a few cafes and restaurants nearby to make your base. Mudchute Kitchen, right on the farm, opens at 9am and serves up tasty homemade breakfasts and hearty sandwiches. The easiest route to Mudchute Kitchen is via the Island Gardens DLR. There are a couple of bars and pubs in Canary Wharf that are ideal for watching the race. You can grab a drink at The Parlour, a bar in the Park Pavilion, which is right near where the runners will pass by. The seating with a view at The Parlour has all been booked up, but you'll still super close to the race. Westferry is a prime marathon-watching location because it's part of the loop, so you'll actually get to watch the runners go by twice. Find a clearing on Westferry Road and bring some snacks and water to sustain you while you wait for the race to pass by. Finally - the homestretch! It's this section that contains the most famous and important landmarks of London, making the London Marathon a truly iconic tour of the city. After passing the Tower of London, the marathon runners will race along the Embankment towards their final destination. Along the way, they'll pass the distinctive St Paul's Cathedral to the right. Designed by Sir Christopher Wren, St Paul's is modelled after the great European cathedrals, with a grand dome that's reminiscent of St Peter's Basilica in the Vatican. St Paul's is one of the most popular attractions in London and definitely worth a visit. We recommend queuing up at Christmas to see and hear the amazing carol concert that takes place inside every year. Running past the Millennium Bridge, Blackfriars Bridge and Waterloo Bridge, the marathoners will end up along the Embankment, taking in some of the most recognisable structures in the city. Across the river they'll spot the London Eye, the huge Ferris wheel that was unveiled in 1999 as part of London's Millennium celebrations. On the north bank of the river, they runners will zip past the Palace of Westminster and the Big Ben clock tower, which is currently covered in scaffolding as it undergoes maintenance and refurbishment. Going past Westminster Cathedral on the right and the Houses of Parliament on the left, the route continues on towards St James's Park in the City of Westminster. Whether you're a photographer, a history buff or a nature lover, St James's Park is a must-see when you're visiting London. It's dotted with cafes and coffee shops as well as colourful flowerbeds and wildlife. Deckchairs along the park are the perfect rest stop for tourists who want to rest their weary feet. St James's Park will be the final destination for the London Marathon runners, but first they must turn the corner around the west side of the park and race down the most important street in all of London: The Mall. This broad, one-kilometre-long thoroughfare, which is painted red to look like a red carpet, is an official royal road used for parades, royal processions and nation celebrations. It's flanked by Union Jack flags on either side, and with Buckingham Palace perched right at the end of it, it's a marvellously British way to conclude the marathon. After the runners cross the finish line in front of Buckingham Palace, many will walk across the road to St James's Park to relax, re-hydrate and bask in the glory of finishing one of the most famous races in the world. Expect to see lots of food, drink and celebration. The area along the River Thames on the Embankment will be seriously packed, especially as you get closer to the finish line. Still, it's a pretty exciting and lively area to choose as your vantage point for watching the 2018 London Marathon. We recommend finding a place between Embankment and Temple to witness the final lap. You could also set up camp in the Blackfriar, a pub on Queen Victoria Street that's near mile 24 on the route and has outdoor seating. If you don't mind big crowds and waiting around for the end of the race, set your sights on The Mall. Here, you'll see all the grand finales and be able to witness the relief on the runners' faces as they finish the competition. Bring a blanket and snacks so you can celebrate afterwards with everyone else in St James's Park. Again, there are quite a few pub options around if you want to celebrate in true British style. Try heading to the Buckingham Arms, a traditional English pub just around the corner from Buckingham Palace. The 38th annual London Marathon is going to be quite the event, with elite athletes like Mo Farah and last year's winners Daniel Wanjiru and Mary Keitany joining in. Keep an eye on travel updates if you're planning on watching the race, and be sure to bring water and to keep your wits about you as you navigate the crowds. If you need any more info, visit the official marathon website at virginmoneylondonmarathon.com.